At the airport look for signs to the airport train station. If you feel it's a long walk - then you are on the right track! Direct trains are leaving every 30 minutes stopping at the main station ("Hauptbahnhof") which located in the city center of Leipzig. You can buy your ticket either at a ticket counter (still in the airport building) just before moving down to the tracks, or downstairs at a ticket machine. Tickets for the regional trains ("RE") are also valid for our local trams within the city limits. Long distance trains ("IC"), which also every now and then connect the airport with the main train station, require a special, much more expensive ticket (which furthermore is not valid on the trams from Hauptbahnhof). From the main train station ("Hauptbahnhof", no. (4) on the map below) take tram no. 16 heading for direction "Lößnig". After a 7 minutes ride get off at the third stop ("Bayrischer Platz", no. (2)). From there it is a short walk to the institute (no. (1)). With only three stops, you can take a "short-ride ticket" ("Kurzstrecke", valid for a maximum of four stops) or just use your RE train ticket from the airport. 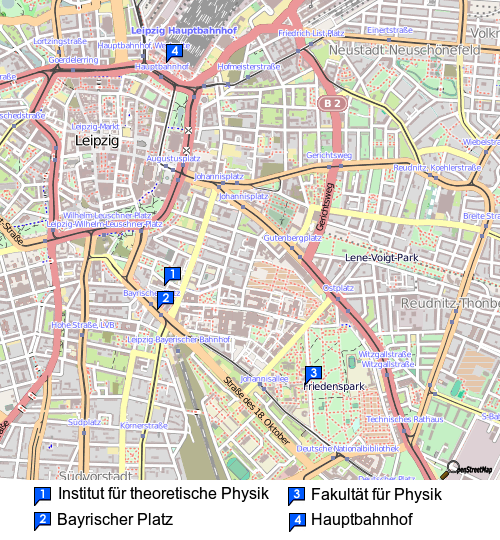 General information on the Leipzig public transportation system and schedules of tram and bus lines can be found at www.lvb.de. From the north: Take the freeway ("Autobahn") A9 in direction Munich until "Schkeuditzer Kreuz", then the A14 in direction Leipzig/Dresden. Exit at "Leipzig-Mitte" and take the highway B2 towards the city center. From the south: Take the freeway A9 in direction Berlin until the exit "Leipzig-West". Then follow the signs to the city center. From tram station "Bayrischer Platz" walk down the street "NÃ¼rnberger StraÃ?e" heading north-east towards "Johannisplatz". 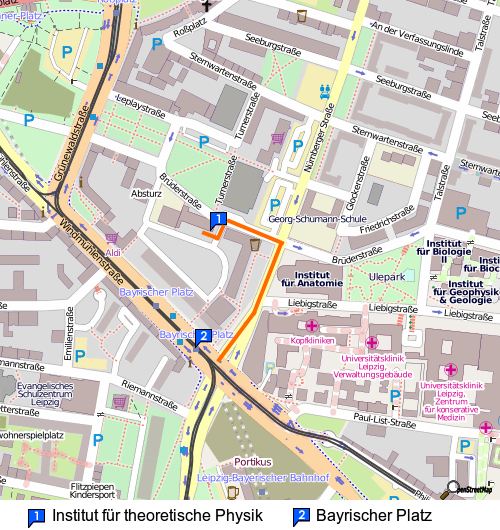 The ITP is located in the street called "BrÃ¼derstraÃ?e" which is the first street on the left. Our offices are above a kindergarten called "Einsteinchen", but can only be entered from the backyard through a yellow door.